Samsung's "The Frame" TVs are already some of the most stylish and living room-friendly models we carry. Samsung's "The Frame" TVs are already some of the most stylish and living room-friendly models we carry. Now you can create a look that's more uniquely your own with Samsung's customizable bezels. Designed specifically to fit Samsung's 43" UN43LS003 Frame TV, these bezels can help the Frame TV fit in seamlessly with your furnishings and artwork. Choose the customizable frame — walnut, oak, or white — that best suits your room. The bezel comes in four pieces, precisely fitting the TV's top, bottom, and sides. Each piece has magnets to hold it in place to the frame of the TV. Installing or removing a bezel is quick and easy. Warranty: 1 year. 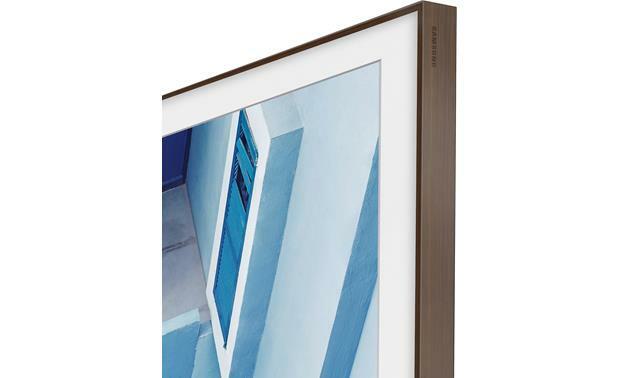 The Frame Customizable Bezel: Designed to be indistinguishable from a modern picture frame in every detail, Samsung's The Frame TV is able to seamlessly blend with any room decor. You can update The Frame TV's black bezel with a more attractive bezel in a walnut, oak or white finish. The custom bezel consists of four pieces which magnetically attach to The Frame TV's standard metal frame to add an even more elegant finishing touch to your room's decor. A custom bezel is available for the 43", 55", and 65" version of the Frame TV.